Akka is a great Scala and Java framework implementing the “Actor” programming model. It allows developers to easily build concurrent systems. Akka takes care of the Actors lifecycle, execution scheduling and communication. The only possible interactions with an Actor are sending messages and receiving back other messages. As the actor’s execution is made asynchronously, it can be hard to test without proper tools. Fortunately, Akka comes with a set of testing tools, the “TestKit”, that come handy when dealing with actors testing. libraryDependencies += "com.typesafe.akka" %% "akka-testkit" % "2.1.4" % "test"
After reloading the SBT configuration, all the TestKit tools should be available in your project. One of the main tool provided by Akka Testkit is the TestKit class. Your test class can extend it and provide an ActorSystem and this system will be available implicitely in all your test cases. Note that you can also use the TestKitBase trait if you need a trait instead of a class. This implicit Akka System will be used by the other Testkit tools and will allow to keep your code as simple as possible. Fortunately, Akka Testkit comes with the TestActorRef class. When you create an Actor with the TestActorRef, it will use a special message dispatcher called CallingThreadDispatcher that will execute the actor receive() method in the same thread it has been sent. Therefore, all your tell() calls will become synchronous and more easily testable. In addition to making the actor message processing synchronous, the TestActorRef will give back a special ActorRef instance that allows you to access the underlying actor instance (which is not possible with standard Akka actors). It allows you to make assertions about some of the actor’s internal states. var lastMsg: String = ""
If you want to test an actor by sending him a message and expecting that it has replied to the sender, you can use the ImplicitSender trait. This trait will define an implicit ActorRef to a fake Actor and this ActorRef will be used automatically as the sender when you use the tell() (or !) method. You can then use the expectMsg…() method available through the TestKit class to check wheter this fake actor has received any message. We went through the basic mechanisms provided by Akka Testkit to allow easy testing of your actors. You can find additional information on the section dedicated to testing in the Akka Documentation. Next time, we will go through more advanced actors testing techniques with the use of TestProbe and AutoPilot. Drupal et son mécanisme de hook permet de modifier le comportement par défaut du core ou d’autres modules depuis ses propres modules. Pour chaque appel à une fonction hookable Drupal va rechercher dans tous les modules activés si ce module implémente ou non ce hook. Si un ou des modules implémentent le hook, Drupal va automatiquement les appeler. Dans la majorité des cas, tout se passe bien, mais il arrive qu’on ait besoin de contrôler l’ordre d’exécution de ces hooks. Par exemple, lorsqu’un module A ajoute une fonctionnalité via un hook et qu’on souhaite modifier cet ajout dans un autre module B. Dans ce cas, il faut impérativement que le hook du module B soit appelé après celui du module A.
Cet article à été publié sur le blog de Clever Age. Vous pouvez le retrouver à cette adresse. When you want to execute some tests that interact with your Models, you need to use a Play FakeApplication. This is described in the Java section of the Play 2.0 documentation. As you can see, there is a lot of boilerplate code that we would like to avoid. To keep my tests really independent of each other, I systematically clean the database before each test. One solution to achieve that is to create a new FakeApplication before each test. This can be done by replacing the @BeforeClass / @AfterClass annotations with @Before / @After and removing the static keyword in the methods’ declarations. It will work well but unfortunately, this will have a bad impact on the execution time. It can be ok if you only have a few tests, but when the number of tests will grow, it can become problematic. It would be nice to find a more efficient solution. To avoid creating a FakeApplication for each test, we could just execute directely some drop table and create table SQL scripts. This should be faster. Now before each test, you automatically have a database cleaned very quickly ! Note that if you have disabled evolutions, you will probably have to hack a little bit more to generate the create and drop scripts directly from Ebean. 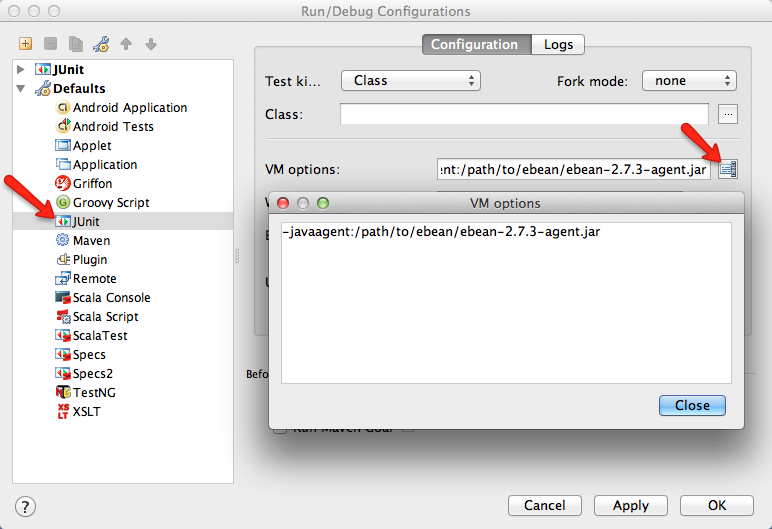 This is what is done in the EbeanPlugin.onStart() method. Once you’ve correctly made your tests work with the FakeApplication, you might want to launch them directly from your IDE. The problem is that your Model class is not enhanced by Ebean when you don’t launch your test from the Play console. Reading the Ebean reference guide , I found a way to automatically enhance your classes by using a specific javaagent. All you have to do is to download Ebean, unzip it and then configure your IDE to add a JVM argument when launching the tests. You can then enjoy running tests from your IDE. If you use IntelliJ, there is an easier solution to enable enhancement automatically on your model classes. You will find in the plugin repository the Ebean weaver plugin that will do exactly what we want. You just have to install it, restart, check the ‘Build’ / ‘Ebean weaving’ menu and that’s all. Note that such a plugin exists also for Eclipse. I hope that with these small tips and tricks, you will be able to enjoy even more discovering Play 2.0. L’intégration de nouveaux composants permettant la gestion des appels asynchrones dans Play Framework a été récemment annoncé sur la mailing-list par Guillaume Bort. Ils ne sont pour l’instant pas disponible sur la version stable de Play, il faut donc récupérer la branche master pour les utiliser. En voici un rapide aperçu avec un exemple d’utilisation. Intégrés dans la librairie F ( play.libs.F ), ces nouveaux composants offrent, entre autre, la possibilité de mettre en pause une action jusqu’à ce qu’un événement se produise. Lorsqu’on souhaite implémenter ce type de fonctionnalité, un problème se pose généralement : comme chaque requête est servie par un thread, si on suspend de manière simpliste les threads, on ne pourra pas avoir un nombre de clients supérieur au nombre de threads alloués au serveur. Même si il est possible d’augmenter le nombre de thread du serveur d’application, on ne peut pas le faire à l’infini et on ne peut que repousser le problème, pas l’éliminer.